We’re pleased to have supported Penrith Cricket Club who received £1,500 from the Ullswater Trust Grassroots Grants Fund towards new grounds machinery needed to maintain their wickets and outfields. Thanks to the new heavy roller, the Club’s fourteen teams are able to continue playing and practising. Before grant-aid, the two grounds of Penrith Cricket Club required many hours of labour intensive work by volunteers and three part-time groundsmen: made difficult with an old heavy roller in desperate need of replacement and not at all fit for purpose. Faced with regular and unaffordable repair bills, the roller broke down on almost a weekly basis. 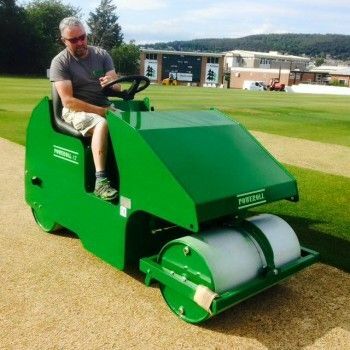 As a Northern Premier League club that hosts Cumberland County Cricket Club games, it is required and expected that the wickets are prepared to a very high standard. Without the machinery this would be difficult to achieve, threatening all future matches. Ullswater Community College will also benefit as they will be able to continue to use the Clubs two pitches and practice facilities for PE lessons, practices and inter school fixtures. Cumberland County Cricket Club will continue to benefit as they host minor County games.